Editor’s note: This article appears in the July 3 issue of ESPN The Magazine. Trick question: Who was the best sixth man in NBA history? season; you want a guy like that playing as much as possible. But it was the ultimate test of the “If it ain’t broke, don’t fix it” theory in sports. At what point does logic override success? Twenty-four years later, another Boston team is asking the same question. 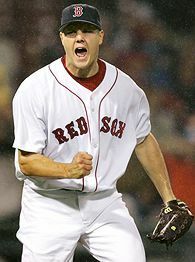 The 2006 Red Sox MVP happens to be a rookie, a potential 20-game winner who hasn’t started a single game this season. Instead, he’s been moonlighting in the closer role, almost like a bartender waiting tables for a few days because two of the waitresses are sick. Now, a few days have turned into a few months. Will he ever go back to bartending? That’s the big question. I’m talking about Jonathan Papelbon, the baby-faced assassin who has single-handedly kept my team’s playoff hopes alive and prevented a Boston Strangler-level panic attack in New England. When Terry Francona opted for Papelbon over floundering Keith Foulke to close the third game in April, Red Sox Nation braced for a closer controversy. It never came. Paps got the next save chance. And the next one. And the next one. By early June, Paps had converted 20 straight and evolved into a Rivera-esque weapon, someone who gets you more than three outs if necessary and seems equally unperturbed in sold-out Yankee Stadium or lifeless Tropicana Field. He’s the best player on the team. There’s no question. Here’s the catch: Papelbon’s ceiling as a starter has been compared to that of everyone from (a healthy) Mark Prior to Roger Clemens. And baseball experts unanimously agree that a great starter is more important than a great closer, if only because we’re talking about 220 to 250 innings instead of 70 to 80. Starters have more value. Starters have longer careers. Starters earn more money than closers. No team that ever employed Clemens, Pedro, Greg Maddux or Bob Gibson said, after the fact, “Man, it’s too bad we didn’t make him a closer.” Yes, Jonathan Papelbon should join Boston’s starting rotation some day. It’s the logical move. It’s the only move. So why do I find myself hoping they don’t make it? 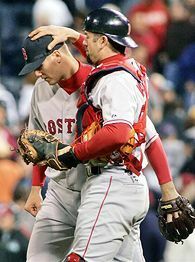 and Bob Stanley) and one postseason hero (Foulke). We haven’t had anyone who remotely resembles young Paps. Over the past 12 weeks, what is most striking is not his confounding résumé — through 66 games, he’s allowed 23 baserunners in 34 1/3 innings and chalked up 34 K’s and just four walks, with 22 saves in 23 chances and an outrageous 0.26 ERA — but the way he carries himself, the body language of the batters and his stuff. into a Mohawk after winning a bet. Basically, he has Clemens’ stuff, Rivera’s composure and Ricky “Wild Thing” Vaughn’s personality. He’s the perfect closer. What’s happening is not a fluke. And he knows it. Papelbon’s saves unfold the same way: strike after strike, some feeble swings, at least one punchout, a giddy fist pump when it’s over. He invariably strikes out the last guy for dramatic effect. My favorite running subplot has been the postgame greeting between Papelbon and Jason Varitek, who jogs to the mound with an impressed smile, followed by an awkward high five and Tek’s rubbing his head like a proud dad. (You can almost imagine him saying, “Well done, Jonathan,” in a stern voice, like a rich dad congratulating his preppie son on a good report card.) He’s failed only one time: the eighth inning of a potential four-out save at Fenway, when the Rangers’ Hank Blalock slapped an RBI single on a 1-2 pitch. Of course, the Sox regained the lead, and a ticked-off Papelbon struck out the side for the victory. It was the kind of thing Rivera would have done. And that’s the right comparison: Mariano Rivera. We have watched dozens of quality relievers over the years, but only a few were dominant forces: Rivera, Goose Gossage, Bruce Sutter, Eric Gagné, K-Rod. That’s about it. You can always overspend for Billy Wagner or call up someone like Chris Ray, but how far will that get you? Can we even quantify Rivera’s worth compared with that of the average closer? Was there a more indispensable player over the past decade, a bigger disparity between the No. 1 and the No. 2 guys at any other position? We rarely consider closers as MVP candidates, but name another player who came through in the playoffs more times. With the way October baseball works in the 21st century — three rounds and 19 possible games over four weeks — an extraordinary reliever might be the single greatest asset for any team. Check out Rivera’s postseason stats: 72 appearances, 111 2/3 innings, 86 baserunners, 87 K’s, an 8-1 record with 34 saves and 0.81 ERA, four rings. During the Yankees’ six World Series seasons, Rivera pitched 87 1/3 pressure innings in 55 games and gave up nine runs. Who else could have done that? or else. Rivera has loomed over every Yankee lead for an entire decade, the grim reaper waiting to be unleashed. Agreed. I like feeling safe in the ninth, holding a trump card in every close game — one who thrives in his particular job more than anyone else at any other position. Maybe it defies all logic, but I hope Jonathan Papelbon stays my team’s closer for the next 15 years.